Here I defined normal cases for that you feel your iPhone X gets heating and you feel like biggest issues. Yes, we can fix it using some techniques that work and causes for iPhone X Overheating. 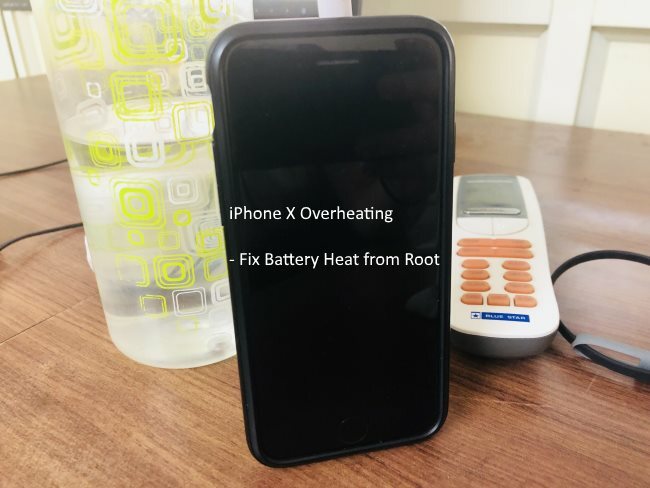 Person to person reason for iPhone X overheating are different like iPhone X overheating on Hotspot, iPhone X Overheating battery draining, While using FaceTime or Video call on List of social apps, Using Wireless Charging, Use of Third-party Charger or iPad’s charger, iPhone X Overheating 4k video, Listen music or Watch YouTube or Video. Today iPhone users using worthless and fancy cases, that useless and harm your iPhone X’s hardware internally. If you read this article then quickly remove your back case and try to use your iPhone X without cover. You can go with iPhone Premium case, not so costly by perfect to use. Your iPhone X is not connected Bluetooth or WiFi. So it will continuously check and scan new Connection around you. Also, this is an issue, while we turn off iPhone and Turn on again, check WiFi and Bluetooth automatically turned on. This is a really serious reason for iPhone X battery draining issue. Check Battery Percentage on iPhone X, Don’t put your iPhone in full night. Turn on Battery Percentage on iPhone X and know how to check? Charging cycle is an important role in any smart gadgets. Here I am talking about iPhone X, Always charge your iPhone for the full battery cycle. Your iPhone will charge 1% in 1 Minute; unplug the iPhone after 90% to 95% charge. Check your iPhone’s home screen and remove the app that can’t in use. Old version App might be the issue. Tap on Hold on App icon until All App icon jiggle on screen with a cross mark. Tap on “X” and Delete app. After delete tap on ‘Done’. Quick Restart: Press and Hold Sleep/Wake button > Side to turn off and Again use side button to turn on. Quick Reboot: Quickly Press and Release Volume up button, then Press and Release Volume down button. Press and Hold side button until you see the apple logo on the screen. Check for New iOS 11 Update, Go to the Settings > General > Software Update > Download and install update. Third party Charger is an always biggest issue; People are buying third-party lightning cable after damage or frayed. Or use it in different places. First take backup of your iPhone X, Open Latest version of iTunes on Mac or PC. Connect iPhone X to the iTunes via lightning cable. Go to Summary section > Backups > Click on the Backup button. Once backup done, Reset iPhone X = Go to the Settings > General > Reset > Reset All content and Settings. Restore iPhone X, Connect to iTunes > Follow on-screen instruction for restore latest back up from iTunes. Still, iPhone X Overheating issue persists, contact Apple support center via online chat or Call. Or Visit nearest Apple Store. Also, Apple is helping for battery issue via Battery Replacement program. Participate in and get free iPhone X battery replacement.